Combine carrots, water, wine, lemon juice, rosemary, marjoram, bouillon granules, and pepper in large skillet; bring to a boil over high heat. Carefully place fish and onions in skillet. Return just to a boil. Reduce heat to medium-low. Cover; simmer 8 to 10 minutes or until fish flakes when tested with fork. 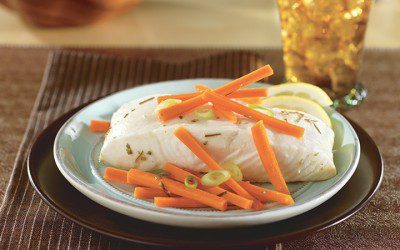 Serving size: 1 halibut steak with 1/4 of carrots. Exchanges per serving: 1 1/2 Vegetable, 4 Meat.